German otologist; born at Randegg, near Constance, Germany, July 15, 1831; died at Heidelberg July 15, 1895; educated at the universities of Prague, Vienna, and Heidelberg (M.D. 1856). He settled in Heidelberg and was admitted to the medical faculty of the university there in 1859. In 1866 he was appointed assistant professor. From 1875 he practised otology, and he was elected assistant professor of that science in 1891. He founded the otological clinic hospital and dispensary at Heidelberg, of which he remained chief surgeon and director until his death. 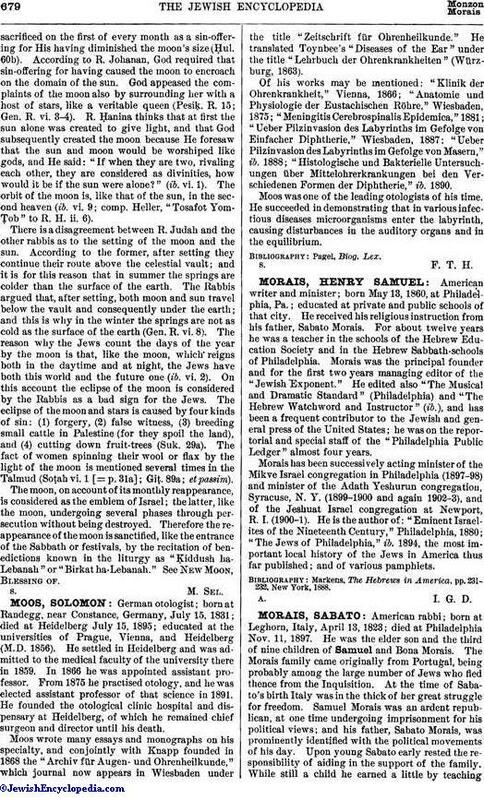 Moos wrote many essays and monographs on his specialty, and conjointly with Knapp founded in 1868 the "Archiv für Augen- und Ohrenheilkunde," which journal now appears in Wiesbaden under the title "Zeitschrift für Ohrenheilkunde." He translated Toynbee's "Diseases of the Ear" under the title "Lehrbuch der Ohrenkrankheiten" (Würzburg, 1863). Of his works may be mentioned: "Klinik der Ohrenkrankheit," Vienna, 1866; "Anatomie und Physiologie der Eustachischen Röhre," Wiesbaden, 1875; "Meningitis Cerebrospinalis Epidemica," 1881; "Ueber Pilzinvasion des Labyrinths im Gefolge von Einfacher Diphtherie," Wiesbaden, 1887; "Ueber Pilzinvasion des Labyrinths im Gefolge von Masern," ib. 1888; "Histologische und Bakterielle Untersuchungen über Mittelohrerkrankungen bei den Verschiedenen Formen der Diphtherie," ib. 1890. Moos was one of the leading otologists of his time. He succeeded in demonstrating that in various infectious diseases microorganisms enter the labyrinth, causing disturbances in the auditory organs and in the equilibrium.